Sheboygan is 50 miles north of Milwaukee, famous for bratwurst and gemütlichkeit. Rick's father, Raymond, worked at Kohler Co., in nearby Kohler, famous for plumbing fixtures. Later, they moved to Milwaukee, famous for sausage, beer, and gemütlichkeit. Rick wrote an autobiography with Gene Wojciechowski (ESPN Magazine) which will be was published in 1999. Rick's royalties go to the Huntsman Cancer Institute at the University of Utah. The title is, "My Life on a Napkin; Pillow Mints, Playground Dreams and Coaching the Runnin' Utes." 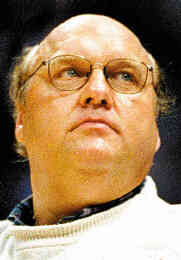 During the 1998 Final Four Rick wore a green ribbon pin in support of organ donation. The pins are a project of the United Network for Organ Sharing (800) 292-9548. Rick donated a Reebok sweater he wore during the 1998 NCAA Tournament to the Cathedral of the Madeleine School. It was subsequently bought at auction by Jon Huntsman. Rick was married to Cloe from 1987-1989. Septuple by-pass operation: Salt Lake City, Dec 14, 1989. Finished 1991 San Antonio Marathon in 5 hours, 54 mins and 29 sec. He finish dead last, but alive. His effort raised $39,000 for charity. Rick had a school-age reading program called "Readin' Utes". In 1992 he filed as a candidate for the Utah State Board of Education. Under the state election rules for that position, a committee presents to the Governor a list of three candidates for each district. The Governor then selects two from the list to appear on the ballot. Coach Majerus was one of the 11 candidates, of the 24 filing, who were interviewed by the District 8 committee, but he did not make the list presented to the Governor. Rick nicknamed Glenn Rivers "Doc" Rivers, for wearing a "Dr. J" t-shirt to a summer basketball camp. e-mail: kbrews@cox.net Original material © 1998-2007 Keith Brewster. Others as noted.